A look at the evolution of EV adoption. Electric vehicles are becoming an increasingly attractive competitor to internal combustion engine vehicles. The term “EV” may be used somewhat loosely across a range of drivetrain types. It usually applies to battery-electric or all-electric vehicles, but can also include plug-in hybrid electric vehicles (PHEVs), which are equipped with both an internal combusion engine (ICE) and a battery that can be charged by an external electric power source. The EV category may also include hydrogen fuel cell vehicles (FCVs) such as the Toyota Mirai, launched in Japan in 2014. The contribution of FCVs to global EV markets remains almost negligible, however. At the end of 2017, according to the International Energy Agency (IEA), the global stock of EVs passed 3 million, while there were only 7,200 FCVs on the road worldwide. EVs have been around since the 1820s. For a period in the early 1900s, EVs were even vying with ICE vehicles for mass adoption. But superior performance led ICEs to dominate vehicle markets up until today. Interest in EVs reignited in the mid-2000s due to concerns over global warming and the falling cost of batteries. Consumer adoption was initially slow to take off, however, with global uptake “still measured in hundreds” in 2005. The pace of adoption has picked up in the last decade, with global EV and PHEV volumes breaking the 1-million barrier in 2015. Bloomberg New Energy Finance (BNEF) figures show that it took 17 months to go from the first million EVs to the second million EVs, and just six months to go from 3 million to 4 million, in 2018. BNEF projected it would take just over six months to sell the next million EVs, reaching the 5 million mark in March 2019. Further ahead, uptake of EVs is likely to be driven by the phasing out of new ICE vehicle sales in Eurasia from around 2025 onwards. The global EV market is dominated by China. The country is responsible for 37 percent of passenger EVs sold around the world since 2011, and around 99 percent of e-buses. The Chinese market saw 579,000 passenger EVs sold in 2017. The government expects China's annual new energy vehicle (NEV) output to hit 2 million in 2020, and for NEV sales to make up 20 percent of the overall auto market by 2025. In future, 42 percent of all EV sales are slated to occur in China, followed by 26 percent in Europe and 25 percent in North America, according to BNEF figures. One factor contributing to the growth of EV markets, particularly outside of China, is the trajectory of the world’s highest-profile electric vehicle maker, Tesla. Production of Tesla’s mass-market Model 3 could have a material impact on global EV volumes. Although Tesla is known for missing targets, in the third quarter of 2018 the company delivered 83,500 vehicles and built 80,142 more. The figures included 55,840 Model 3 deliveries, up from 28,578 in the previous quarter. A growing number of Chinese automakers also have ambitious plans for growth. SF Motors, for instance, aims to make 200,000 cars per year. An electric SUV maker called Nio, meanwhile, is looking to build sales on the back of a $1.8 billion IPO. Charging infrastructure availability. Major charging infrastructure rollouts have been a feature of markets such as Norway, which has the highest per-capita level of EV ownership in the world. 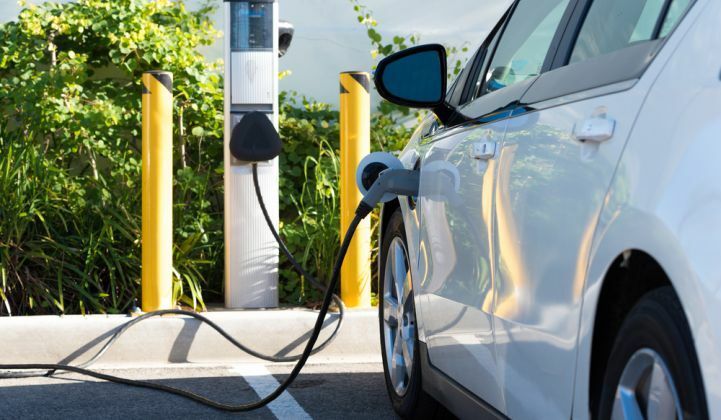 Wood Mackenzie predicts there will be 40 million charging points worldwide by 2030. Incentives and other benign EV policies. The high cost of EVs relative to ICE vehicles means incentives have played a critical role in boosting adoption in markets such as California, where EVs made up more than 6 percent of all new car registrations in the first half of 2018. Battery costs. The lithium-ion battery packs used in EVs and in stationary energy storage are expected to fall in price by more than 80 percent by 2040. Production will quadruple by 2025 and every doubling in capacity will lead to a 5 to 8 percent reduction in costs. One major potential issue affecting battery costs, and therefore EV adoption, could be the availability of raw materials. Global battery demand is expected to grow 40 times by 2040, according to a Wood Mackenzie analysis. This will put significant pressure on lithium, cobalt, nickel, graphite and copper supply chains, with analysts expecting shortages by the mid 2020s.